Winners for the 2018 Imadjinn Awards were announced, including several titles of genre interest. 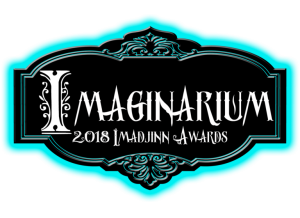 Winners were honored at an awards ceremony held at Imaginarium 2018, October 5-7, 2018 at the Ramada Plaza Hotel and Conference Center in Louisville KY. For more information see the Imaginarium website. Small correction: INVISIBLE 3 was coedited by myself and Mary Anne Mohanraj.